TELL YOUR FRIENDS AND COME ON DOWN! HELP US GET THE WORD OUT FOR THIS GREAT EVENT! The 2014 Mosaic Festival is a celebration of our city’s cultural diversity! Enjoy music and dance from around the world. This free event provides an opportunity to foster greater understanding, appreciation and respect for cultural diversity. The event is Saturday, November 1 on the square in Historic Downtown Garland from 9 am to 2 pm. Yes! You bet your cowboy boots and Mexican serape, Loving Garland Green will have a booth there. Look for us right across from the Generator Cafe. We will be selling a large amount of plants, pots, Dia de los Muertos items, yard art, wind chimes, "a little bit of Texas in a cup", handmade items such as knitted beanies for skateboarders, crocheted skull appliques, handmade bags, homemade soap and if you can believe it--even more! Come on down and help us celebrate diversity in all forms--from people to plants. Vendors! There may still be time to secure an affordable booth for this event if you act now! CALL MARCI TODAY AND GET IN ON THIS GREAT EVENT. For food and drink vendor information, contact Marci Adame, CMC, Mosaic Chair (972) 612-4463 or coach_madame@yahoo.com. DOWNLOAD THE INFORMATION PACKET FOR THIS EVENT. Garland's 12th Annual Neighborhood Summit. Today I attended Garland’s 12th annual neighborhood Summit—an event where people of Garland get together and talk of neighborhood problems and solutions and celebrate successes over the past year that lead our community closer to the realization of our vision of a more sustainable and healthy Garland. This engaging interactive annual event offers the opportunity to explore trends and opportunities that will help Garland residents to fully own and participate in the reality of a better, more sustainable and more beautiful Garland. We need to stop waiting for someone to save us and start saving ourselves with our own solutions. Once again I was reminded of the importance and responsibility we have as individuals to talk with one another and to come up with solutions for the environmental issues that face our communities. These solutions to our problems will not be coming from a one-size-fits-all national level. These solutions will not even be coming from a one-size-fits-all state level, especially for states the size of Texas. For example, an environmental solution that might fit El Paso, may not work here in Garland. Innovative solutions and new directions toward more sustainable lifestyles will arise at the local level. In fact, many of these solutions will arise at neighborhood and individual resident levels. It’s not the “experts” who are going to save us and our environment. In fact, we need to stop listening to some experts before they completely do us in. It is ordinary citizens who will lead the way to innovations and solutions that work. We have this capability to effect workable solutions because we are not invested and indoctrinated in the ineffective top-down solutions that are currently being applied. We are the ones to ask “why? “, and more importantly, “why not?” For lack of a better analogy, we all must become more like the little child in the fable of “The Emperor’s New Clothes” who pointed out the truth that the emperor was naked. The large, top-down corporate industrial ways of managing our resources—particularly our food and water—have largely failed us. Instead of “saving us”, these modern industrial models and methods have in many instances made us more vulnerable to disasters than ever before. We need to take the reins back and guide our communities in sane directions that serve us. Together, as ordinary citizens, we can discover new and better solutions for our community but only if we start talking with one another. One of the sessions I attended today was led by a presenter from the North Texas Municipal Water District. The topic was water conservation and discussions of the drought as “the new norm.” The speaker talked of an impending multimillion dollar build of yet another huge reservoir (as soon as 11 farmers who want to hold onto their land are dealt with). Of course, this reservoir will be located miles away from Garland. This solution of remotely locating the source is similar to the top-down corporate industrial management of our food system whereby most of the food must travel a distance of 1,500 miles to our supermarket shelves. This is absurd--particularly when we can grow most of our food locally. Instead of these types of solutions, we need to implement local solutions. At least 50% of our food and water supply should and can be supplied from right within out local community. Moral admonitions underlining the virtue of austerity and doing without are often brought into attempts to prop up continuance of failed top-down managed solutions. For example, the presenter today suggested that we need to make wasting water as socially unacceptable as smoking as part of the solution. In other words, instead of stepping outside the box and coming up with better solutions, let’s treat this problem as a behavioral issue. Let’s “educate” people so they feel guilty enough to replace their lawns with crushed gravel and install drought-resistant plants in their yards. Ironically, it’s often the people who come up with these solutions who themselves need lessons in behavior modification. For example, almost immediately after suggesting that citizens be shamed into conserving water, the presenter mentioned that 166 million gallons of water are flushed down our stormwater drains every year. By the way, this is water that would be perfectly good for watering our yards and flushing our toilets. Yes at least 166 million gallons of water is wasted each year in our local area merely because of existing state laws and policies of our water officials. And these are the same people who admonish us to conserve water. I was shocked when I heard this. The attitude of the speaker in regard to this waste seemed to me to be one of acceptance. I base this judgment on the fact that I did not hear of any plans for correction—immediate or future. A women in the audience spoke up and commented on the waste saying that she has a system at her home that conserved the condensation from her air conditioner that annually supplies most of the water for the plants in her garden. Speaking of "the norm". . . .Flushing Millions of Gallons of Usable Water Down the Stormwater Drains is the Norm, not the Exception in the State of Texas and it needs to stop. Later this evening, still amazed at this waste, I did a little research. I found that Lubbock, a city of 239,538, similar in size to Garland, annually flushes more than 9 million gallons out of its water mains and down the drain. That is a lot of wasted water. It is the equivalent of what 1,200 homes in Lubbock use in a month. “A monthly flush to check a line’s chlorine level takes about 15 minutes and uses roughly 17,500 gallons of water, unless a second 15-minute flush is required. But a recent city project has significantly reduced its water loss. Required by state law and regulated by the Texas Commission on Environmental Quality, these flushes are to ensure the city’s water supply is safe to drink. NOTE: Someone perhaps needs to remind Mr. Galmore that while no one is suggesting that people should drink this water, there should be more than a few citizens standing up and suggesting that it be diverted and stored for use on gardens, lawns and other landscaped areas such as municipal parks. Solutions are here now but they are not likely to arise from the the ranks of those who are vested in maintaining the status quo of "how it's always been done" or "how Washington does it" or even "how Austin does it." The solution is not moral behavior modification of local residents so that we will wrap our minds around unacceptable and inherently wasteful solutions while continuing to tighten our belts and adjust our bootstraps. Instead of continuing to adhere to what I would dub "a scarcity model", perhaps we would have more success if we approached our local environment as a "bountiful universe" that, when managed properly, will yield us all that we need to sustain us in prosperity and health. There are solutions. Currently Loving Garland Green has a project hanging in the wings waiting to see if it will get support from our local Parks and Recreation Department and our Water Department as well. Our proposed project involves a technique called "rainwater harvesting." A 1,200 square foot roof, given the current annual rainfall of Garland, will yield 26,000 gallons of water annually. We have done the preliminary calculations of a shed currently located on park property as well as a privately owned building located up hill from that shed. These two buildings would yield us 100,000 gallons of water a year. Combined with the annual rainfall on the garden, being able to store this water would be more that enough to supply all the annual water needs for the Garland Community Garden. This project could serve as a model for the development of similar projects in our community. We are waiting to hear from the City before approaching the private party regading our proposed project. The issue with water availability from rainfall, even given our current drought, is our current inability to store rainwater that we might harvest from our roof tops and other sources such as from condensation. The typical 55 gallon drums we have for rain barrels at many of our homes are not sufficient. It might be possible to develop a water system to be used for landscape purposes at a neighborhood level--perhaps a system where resident's rain barrels when full would flow into a neighborhood reservoir. The problem that needs a solution is not that we don't have enough water, even given our drought conditions. The problem is that we currently don't have a way to store it locally so that we may use it as we need it. If we let go the belief that all the water to meet all the needs of our residents must be stored in one large reservoir located 20, 30, even a 100 miles from us, we might start designing some real solutions that work for us at the local level. Help Loving Garlad Green Solve the Mystery: Who left these mystery plants at the Garland Community Garden and What are they? Yesterday a small bucket of plants was left down at the Garland Community Garden. 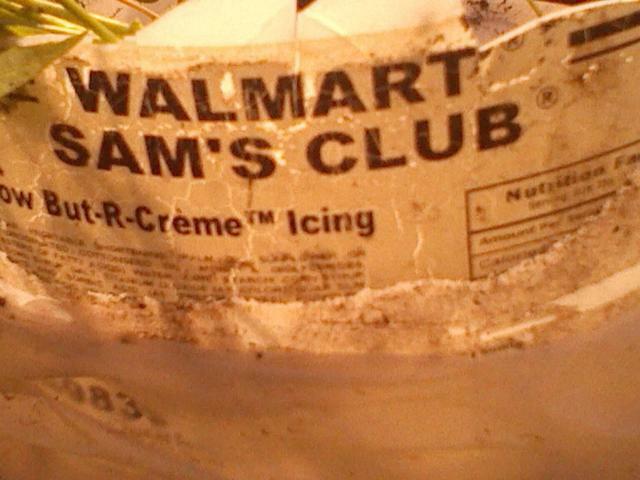 A broken plastic pot that once was home to icing sold/used by Sam's Club. was filled with dirt and the plants were laid across the top of the dirt. The container and about 30 plants were in a plastic bag. They range in size from six to twelve inches long. At first I thought the plants were most likely winged beans a type of Asian green bean. I planted most of them in the multicultural garden plot and a few of them back in the Winding Garden. They are surviving but today they look more like pepper plants than bean plants. You can go down to the garden at 4022 Naaman School Road and see if you know what they are. Look for the multicultural garden plot. It will be identified by a sign. 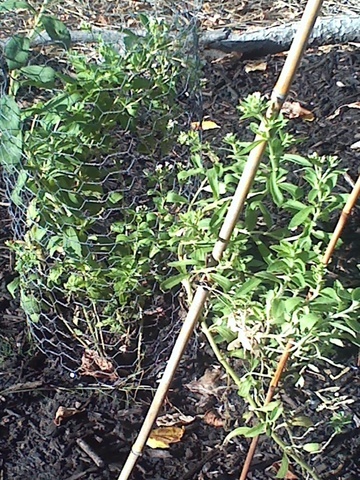 The orphans in question are the ones planted by the chicken wire trellis. If you know what they are or if you are the one who left these orphans on our doorstep, please call me at 972-571-4497. Looking for somewhere to go? Go to the Garland downtown square. Pumpkin with the Marigold and Tarragon Hair - E. Berry's Entry in Pumpkin Decoration Contest and another entry from another person "Pumpkin with bar of soap in mouth"
It's lots of fun to be a part of the local scene in Garland. You'll see all the important people. For example, when I was down there this morning I ran into Mayor Doug Athas and also his assistant, Beth. We have a great mayor who is very active in all of our community activities. He was wearing a T-Shirt from todays Purple Passion 5K Run, a collaborative event benefitting the Garland New Beginning Center and Hope's Door, a nonprofit devoted to helping families affected by domestic violence in Richardson. Doug often attends several events daily, particularly on the weekend. There are lots of carnival type games for kids where they can throw balls for prizes. In addition, there is a bouncing house and lots of cute dogs that members, perhaps from Pawsibilities are walking around in hopes of making connections with new owners. I talked with two new entrepreneurs this morning: Cameron Fuentes, from White Rock Soap Gallery and Adam Dodson from Cowtown Candy. It's was interesting to me to note some similarity between their two stories, even though one was selling soap and the other was selling candy. Cameron who graduated this past June with a degree in psychology from the University of Texas in Austin was given a book on soap making for Christmas last year by his father. His business, White Rock Soap Gallery, has been in operation for about six months. From the looks of things, business is booming. His soaps are beautifully packaged and include some interesting combinations. For example there is a lotion that Cameron offers that is in solid form. You pinch off a tiny piece of it from a small can, just a bit larger than a lip gloss can. It's amazing the moisturizing power in such a small piece. In addition his soaps have some surprising mixtures. For example, there is a bar made from rosemary and charcoal. I was a bit surprised about the charcoal content, but Cameron assured me that charcoal has a purifying affect on the skin. 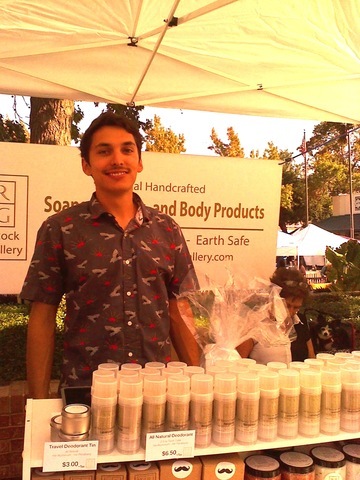 For more information on his company, visit his website at www.whiterocksoapgallery.com. 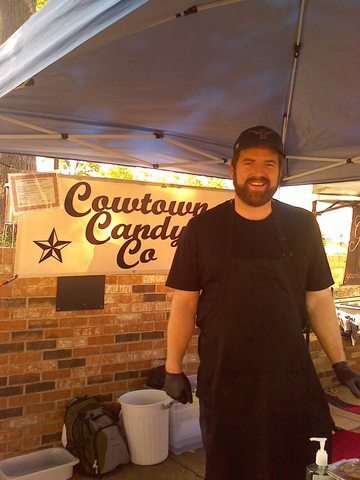 Adam from Cowtown Candy Co is from Ft. Worth; however, like Cameron, he too recently moved back to the area from Austin. Candy is not something new to the life of Adam. HIs mother has been making candy in her own candy business ever since Adam can remember so he knows the business well. His specialty includes various twists on peanut brittle. Adam sells all kinds of peanut brittle--from jalapeno peanut brittle to chocolate peanut brittle to coconut peanut brittle. And yes, he also sells the traditional peanut brittle. He confessed to me that the traditional recipe is his favorite. I sampled them all and I like the chocolate hot/spicy peanut brittle best, but all of it is fresh and delicious. Speaking of "delicious", I stopped by to chat with Stephannie Cole from Pic-licious. Stephanie uses local sources for her supplies. Her food products are all pickle-based and quite interesting combinations. For example, she makes sweet and savory, "guilt-free" dessert pickles featuring: Caramel English Toffee, Dutch Chocolate, French Vanilla Ice Cream, Banana Cream Pie, Cheesecake and Peach Cobbler. She makes beverage pickles such as Pina Colada and Hurricane Rum. She makes fruity pickles such as strawberry and grape. As Stephanie says at her site, it was Pic-licious. Her pickles will add a new twist to any meal. To contact her directly, call her at 214-670-2042 or you can write to her at stephaniepcole@yahoo.com. She already has a restaurant in Irving that is serving her zesty marinades. ARE YOU CRYING IN YOUR BEER (OR WATER) BECAUSE YOU ARE ALREADY BOOKED AND IT'S TOO LATE TO ATTEND THE AUTUMN FEST TODAY? The 2014 Mosaic Festival is a celebration of our city’s cultural diversity! Enjoy music and dance from around the world. This free event provides an opportunity to foster greater understanding, appreciation and respect for cultural diversity. The event is Saturday, November 1 on the square in Historic Downtown Garland from 9 am to 2 pm. Loving Garland Green will have a large booth at this event. We plan to feature many plants and cultural items for sale. The theme for our large booth will be Dia de los Muertos in honor this Latin traditional holiday devoted to honoring the dead. Kick off the holiday season with some great shopping with unique and festive vendors, yummy culinary items, gifts galore, live entertainment and fun for the kiddo’s! It’s all happening in historic downtown Garland & supporting Good Samaritans of Garland. AND bring some canned & prepackaged to donate to Good Samaritans…They need LOTS of holiday pies as well, for their pie drive! This event is produced by Eventive Marketing Solutions and is presented by the Garland Downtown Business Association, and supporting Good Samaritans of Garland. Loving Garland Green is also getting things together for our booth at this event as well. I was over at Margie's this morning after I returned from down town. She has some great ideas for plate flowers to stick in your yard for the holiday season--red and green, with snowmen and more. A week or so ago I decorated for Halloween. 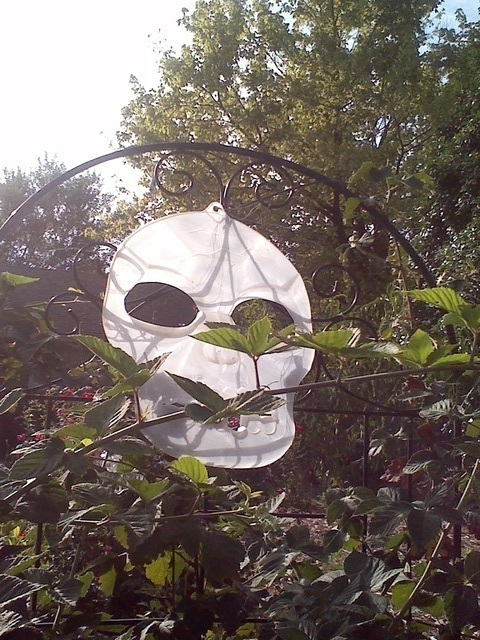 My decoration for this celebration is singular--a large glow-in-the-dark skull that I hang on my blackberry trellis. As usual, I get at least one negative comment regarding the presence of this decoration. Normally I just listen to all the reasons why I should not have this skull in my garden and nod politely. This year, however, I've decided to put forth my thoughts on this topic--just because. Easter and all the related religious celebrations are celebrations of life and hope and spring. All these celebrations as most of us know had their original roots in primitive pagan celebrations centered around the spring equinox. No one religion or group owns exclusive rights to these celebrations. Halloween is a celebration of the harvest, the gathering of the seeds for the new year, and death--another stage in the cycle of life. Some form of death in all of nature is necessary for rebirth and regeneration--whether we are talking about Humans, animals or plant life. Halloween is also a time for remembering those who have gone before us with Nov 1 celebrations such as Dia de Muertos (Day of the Dead) and All Saints Day. Deciduous trees lose their leaves in fall. These fallen leaves then nourish the new leaves for the tree in the coming spring. Many plants wither and die in the fall, leaving behind the hope contained in their seeds for the coming spring. It's all a part of the cycle of life. All true believers know that even Jesus Chrisit died on the cross and on the third day arose from the dead. Dying metaphorically and/or physically is a necessary prerequisite for rebirth and transformation. Most will agree on this one point even if there are almost as many people as opinions regarding what forms are taken in the rebirth stage. Here is the skull in my garden in October 2013 as a reminder of another stage in life. The ending of a life in its current form is as much to be celebrated as its beginning. To deny this celebration is to be in denial of the cycle of life on this earth. Thus I hang a representation of a skull in my garden among my dying plants as a reminder that death is a part of the cycle of life. All must die at some point in time in order to be reborn into a different form--metaphorically and physically. 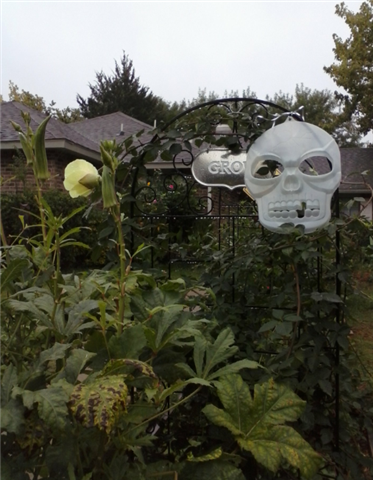 I put the skull in my garden each October as a reminder and in respect and recognition of this stage in the cycle of life. Thus I celebrate Halloween just as I celebrate Christmas--a celebration of light and hope for the world and I celebrate Easter as a time for when the hope is fulfilled. Halloween is no more or no less a pagan celebration and all the other celebrations for the changing of the seasons. October 8, 2014 - Several of the people who attended the installation of the Garland Community Multicultural Commission plot at the Garland Community Garden pose for a photo. 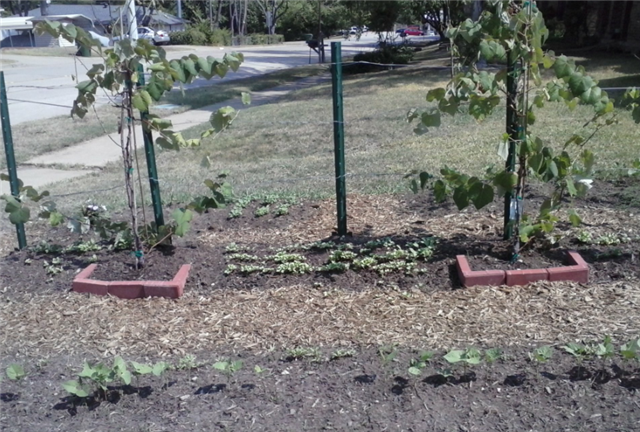 The Installation of the Garland Multicultural Garden Plot was a success! This warm, friendly and personal event was well-attended by people representative of many cultures in our community. 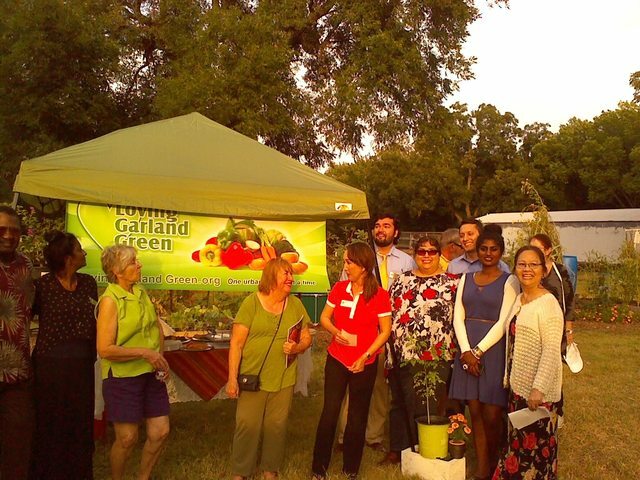 It was an informal event where guests paired up with various members of Loving Garland Green and toured areas of our Garland Community Garden. Charlie Bevilacqua, one of our board members, assisted guests who wanted cuttings of our citronella plant, red okra and loofah while other members chatted with our guests to the garden. Jennifer Nguyen, Chair of the Garland Community Multicultural Commission, presented Loving Garland Green with seeds from plants that we don't normally see on the seed racks in our local stores--a reminder to visit our Asian markets here in Garland too. Malabar Spinach, Kohlrabi and Bitter Melon. This commission is an advisory group to the City Council who serve as an advocate for creative and full inclusion of all Garland residents so as to enhance the quality of life for all. Loving Garland Green is proud to join the Commission in promoting and celebrating our City's rich assortment of cultures. This plot will feature plants that many of us may never have heard of. Plant diversity, like people diversity, is essential to the health and food security of any community. Gotu Kola was among the plants installed yesterday evening in the new multicultural garden plot. Gotu kola is a plant that grows naturally in Madagascar, India, Sri Lanka, Indonesia, and many parts of South Africa. Its dried leaves and stems are used in herbal remedies. The active compounds in gotu kola are called saponins, or triterpenoids. Gotu kola has a long history in the folk medicines of India, Indonesia, Sri Lanka, and Madagascar and is still widely used in these countries today. It has been used for generations in India to promote relaxation, improve memory, and aid meditation. In traditional Chinese medicine, the herb is believed to promote longevity. The Chinese name for gotu kola translates to "fountain of youth." A Sri Lankan legend says that elephants have long lives because they eat gotu kola. A commonly used green in Sri Lanka (daily in the diets of many people in Sri Lanka) this green can be served as a salad or as porridge. The plant is a perennial and grows like a weed. It dies back in the winter and returns in the spring. It can easily be propagated by division during the summer and will root at the nodes. It is a low growing creeping plant which can be used as ground cover. Kaushalya Siriwardanda, a member of the Garland Community Multicultural Commission and founder of Helping Hands, brought the gotu kola plant from her garden for installation. Wash the Gotu Kola and chop finely. Set aside. Chop the shallots and green chili. In a medium bowl mix gotu kola, onion, green chili, grated coconut, pepper and salt Lastly add lime juice and mix again. Contact Loving Garland Green: If you have relocated here from another country and are currently growing edibles or flowers at your home that are not native to Texas, please call us at 972-571-4497. We would love to have some seeds or transplants from you for this garden plot. The Garland Community Multicultural Commission is another group worth checking out. Their mission is to maximize the potential inclusion and quality of life of all citizens in the City of Garland by identifying issues and making recommendations to the City Council concerning the City's changing demographic composition and diverse needs. Visit their website at the City of Garland website. Their meetings are open to the public. OUR GARLAND COMMUNITY MULTICULTURAL COMMISSION IS NOT LIMITED TO GARDENING. They also host one of the most special events of the year here in Garland. Be sure to mark your calendar for Saturday, November 1! The 2014 Mosaic Festival is a celebration of our city’s cultural diversity! Enjoy music and dance from around the world. This free event provides an opportunity to foster greater understanding, appreciation and respect for cultural diversity. The event is Saturday, November 1 on the square in Historic Downtown Garland from 9 am to 2 pm. Rocky Penn (center) at the East Dallas Community Garden along with two other members of their East Dallas Community Garden and Marketplace located at 1416 Fitzhugh, Dallas, Texas. The Common Language in Our Community is "Garden"
Nancy Seaberg, the Loving Garland Green Chair for an upcoming multicultural event at the Garland Community Garden tomorrow, called me this morning and mentioned that perhaps early on Saturday morning we could visit the East Dallas Community and Market Garden at 1416 Fitzhugh. This is one of the few community gardens in the area that I haven't visited. Charlie and I had planned to stop by there last fall on our way back from the garden at Paul Quinn College, but time got away from us. After talking with Nancy, I realized that I would not be able to visit the garden on Saturday due to a prior commitment to attend the Trash and Bash event sponsored by Keep Garland Beautiful. Impulsively I decided I had just enough time to cram in a visit this morning if I hurried. Am I glad I did! Not only was I able to see the beautiful and productive East Dallas Community and Market Garden, I got to meet Rocky Penn who gave me a bitter melon and some hot Cambodian peppers. Turns out that Rocky lives in Garland near Jupiter and Walnut. Of course he has his own garden there too which I plan to visit sometime this month. Lilly Bui, one of our Loving Garland Green members, has mentioned that her mother grows a plant called "bitter melon" and I've been curious about it for some time. 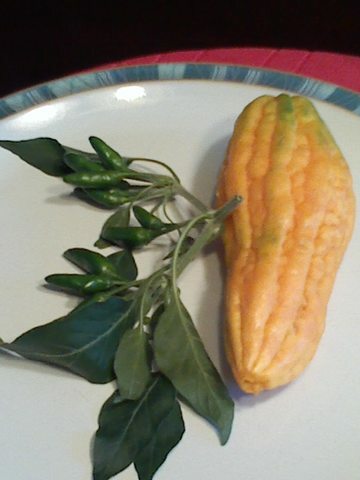 The fruit of this plant, as its name implies, is bitter--a taste that we don't often experience in our American diets. I asked Rocky about bitter melon this morning and he took me right over to a huge vine where I was able to see these plants growing. They are similar to squash. This vine and all the vines I saw were growing on a trellis--some were horizontal flat rooftops of vines looking somewhat like small carports with a vine roof. Also there were vertical trellis. However I did not see any of their vine crops growing directly on the ground as we tend to grow many of our vegetable vine crops such as pumpkin and squash. Example of one of the horizontal trellis at the East Dallas Community Garden and Market is shown in the photo above. This one holds some Asian melons. Above is a bitter melon that Rocky gave as as gift to Loving Garland Green along with a sample of some very hot Cambodian peppers. The bitter melon is not for eating at this stage as shown in the photo. It is for seeds next year. 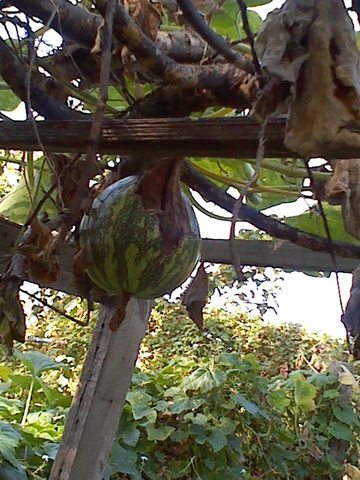 Yes, we will have a bitter melon vine in 2015 in our multicultural plot at the Garland Community Garden. 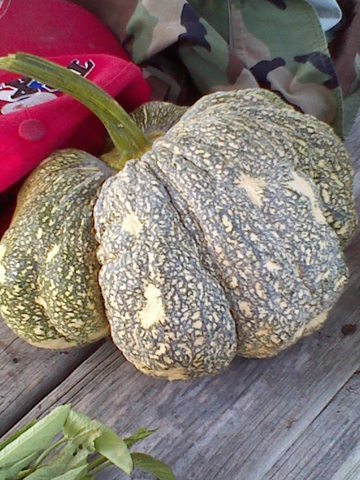 Asian pumpkin from the East Dallas Community Garden. 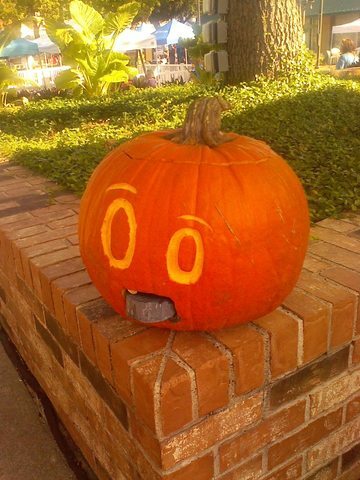 Now this would make for a real scary jack-o-lantern. I wonder what they taste like? I'll try to purchase one in the coming month and see. Yes, I have Rocky's contact information. 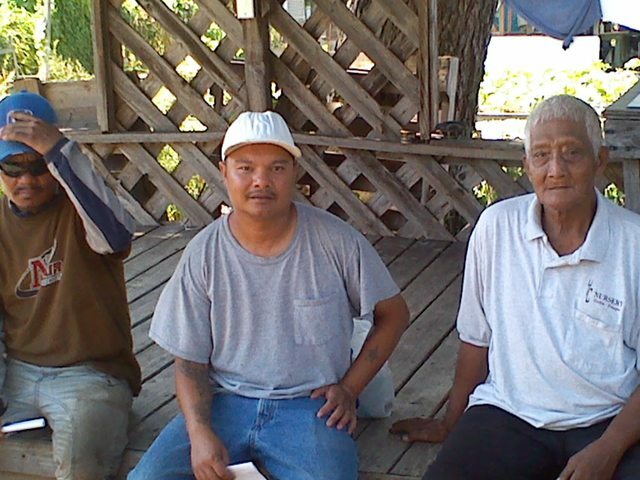 Yes, I'll be contacting him to visit his garden here in Garland and yes I'll be hounding him to help us get some of these Cambodian varieties begun in the Multicultural plot at the Garland Community Garden. The Garland Community Garden is a little different from many community gardens. It is stewarded by Loving Garland Green, a local nonprofit organization whose members (ordinary citizens) are dedicated to encouraging Garland residents to grow at least some of their food at their homes. 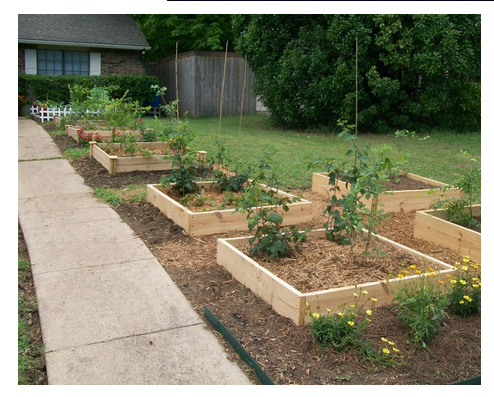 The first garden bed was installed at the Garland Community Garden on April 12, 2014. It is our intention to show, by example, the variety of edibles and bee-encouraging flowers that can be successfully grown in the Garland area. To further encourage and educate, this garden has signs throughout telling visitors about the various plants and gardening formats. The multicultural garden plot represents an extension of the learning format for our garden. Some of the most beautiful and productive gardens in our city are those grown by residents who are not native to Texas. Many of the plants in their gardens, such as the bitter melon mentioned above, native Texans have never heard of. We hope that through the installation and participation of members of our immigrant community to further expand the plant diversity and thus the food security of our community. What Grows Well in Garland Texas? I'm a good resource for reporting on what grows well in Garland. I'm new to the gardening scene, having begun my first garden on June 12, 2013. Thus if I report that something has grown well, you can be almost certain that if you live in Garland that you will be able to grow it as well. As far as I'm concerned, there are two reasons for an urban garden, or a combination thereof: 1) you want to grow food that you like to eat and that is expensive to purchase in the supermarket or 2) you want to grow plants that you can sell. The photo above shows my blackberries shortly after they were planted in July of 2013. 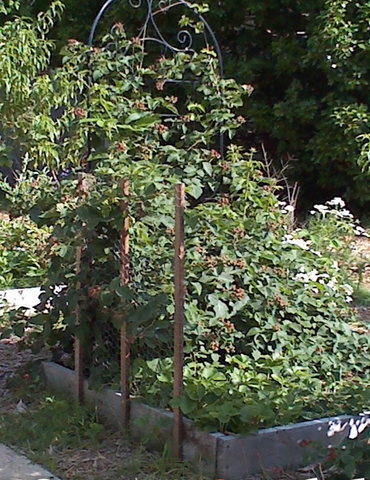 The photo above shows one of the blackberry beds as it looked in June of 2014--laden with berries. I had no problem with birds--not even a little bit. I had a plastic owl guarding them about 4 feet away from the bushes. They are at the top of my list. I planted four thornless blackberry bushes in July of 2013. In 2014 they produced a little over 55 pounds of delicious blackberries from the beginning of May until just about the middle of July. Beyond watering them, I did nothing special. They were planted two plants each to four by four foot raised beds enclosed by wood about 8 inches high. At the typical market value of $4.98 for 12 ounces, I grew about $360.00 of blackberries. Another reason for choosing blackberries is because of their great nutritional value. Blackberries are rich in antioxidants which protect cells from damage against free radicals--the root cause of many cancers. One cup of blackberries provides 50% of all the vitamin C needed daily and 36% of your daily requirements for vitamin K.
Another plus for blackberries is that you can freeze them for later use. I've planted several new bushes this fall--a few in my yard and four down at the Garland Community Garden. Some complain the blackberry is an invasive plant and will take over your yard. Being aware of this, I've watched mine carefully and thus far, this is not the case with the plants I have. Neither pair has grown outside its box. My grape vines shortly after I planted them in late August of 2013. 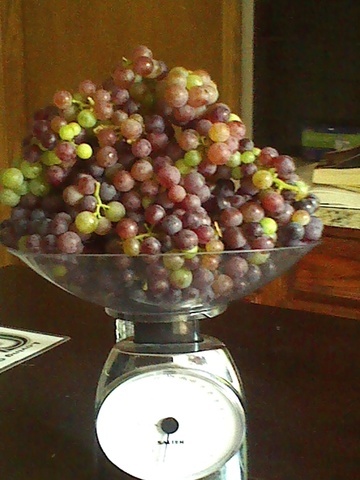 The photo above represents just some of the bounty from these two vines in 2014, less than a year later. Grapes are also high on the list of plants I recommend to grow in Garland. In August of 2013 I planted two vines in my front yard garden. Both vines are Mars (Plant patent 5680), a release from the University of Arkansas, a vigorous, blue seedless grape. The grapes taste wonderful. The vines were not sprayed (nor will they ever be). These two vines produced well over 35 pounds of grapes in 2014. Between my blackberry bushes and grape vines, I more than broke even on any expenses incurred with my garden in 2014. Down at the Garland Community Garden I planted three grape vines--all with seeds and all plants recommended for growing in Texas. We'll see how they do next year when harvest rolls around. I looked all over the DFW area for the Mars seedless grapes but could not find them. Bruce Miller Nurseries who carried them in 2013 did not have them in 2014. The Loofah has turned out to be a beautiful surprise. You can still see it blooming and growing at the Garland Community Garden on 4022 Naaman School Road. Loving Garland Green hopes to encourage our residents to grow food and plants for other uses as well by being the example ourselves of what urban farmers can accomplish. None of us are horticultural experts, although some of us are taking permaculture courses and several have applied to become Master Gardeners. We want to show just how far an ordinary citizen can go. Gardening is a hobby that can easily grow into a vocation. 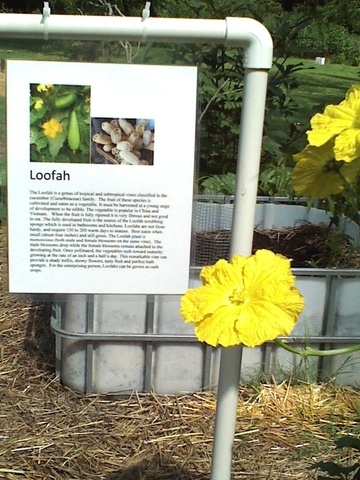 The loofah is edible--its blossoms as well as its fruit (as long as the fruit is less than four inches long). Once the fruit is longer than four inches, it becomes too fibrous to eat, but it makes great scrubbers for the body as well as for your pots and pans. At the August 2014 Garland Marketplace we sold 24 loofahs from our plant at $2.00 each. Currently we have at least 30 more that will be ready to sell in October. Thus this one plant will have earned us over $50. Additionally, this one plant is growing out of an 8 gallon recycled plastic container. Two Stevia plants in my urban garden at home. I'll protect them over the winter and see what happens this spring. If they don't survive, I'll just plant more. In fact, I may plant an entire 4 x 4 foot bed with stevia. Its leaves can be dried and used throughout the winter for no calorie sweetener. Last night I made a cup of stevia liquid sweetener and served it to a few Loving Garland Green members who said that it works as a sweetener. 1. Take a branch from the plant. 2. Wash the leaves. 3. Strip the leaves into a small sauce pan, 4. Add about a cup and a half of water 5. Bring to a boil and then reduce heat. Simmer for about 10 minutes. 6. Turn off heat and let sit covered on stove top till cool 7. Use a strainer and pour into a glass jar with a lid. 8. Refrigerate for up to two weeks. Use in the place of sugar. I have saved some of the seeds. However, everywhere I read the advice that Stevia is difficult to begin from seed. It's best to start it in the spring from a plant. Stevia is a perennial that we can overwinter with protection here in Garland. However, after its second year the plant loses its vigor. NOTE: Charlie suggested that I include tomatoes and brussels sprouts. The jury is out on the brussels sprouts as I didn't grow any in my garden last year. As far as tomatoes go. 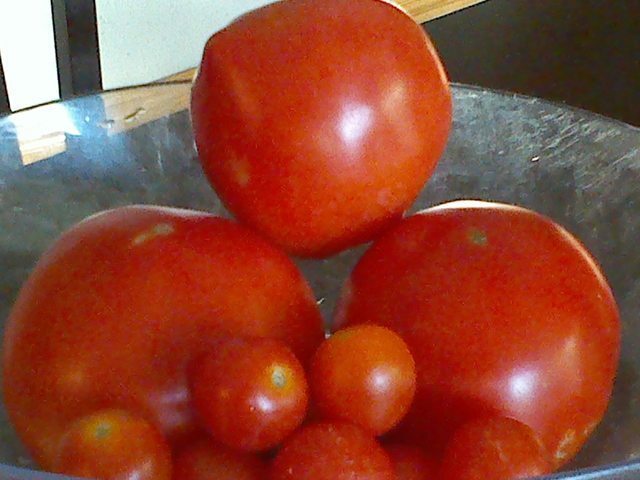 . . well I tried and many of my friends from Loving Garland Green tried with the tomatoes. Charlie is the only one I know who had great success. He grew over 100 pounds of tomatoes this year in the raised beds around his swimming pool. We will be enjoying tomato sauce from them all winter long. His brussels sprouts were also outstanding. We protected them over the winter and from December through February they yielded many meals. I think there are a few people who can grow tomatoes in Garland and a few who cannot. That's just my theory. It may or may not be true, but I don't think I can grow them and that's just about a proven fact as I've tried with no success two years in a row.